Describe the business value of custom objects and fields. Create and edit custom objects and fields. Ursa Major Solar is a Southwest-based supplier of solar components and systems. It’s a small company with around 200 employees, but it’s growing fast, and it’s looking to Salesforce to help the company blossom. Maria Jimenez, its admin, is in charge of configuring and customizing Salesforce to meet Ursa Major’s needs. Ursa Major Solar is expanding its energy consultation business and offering personalized energy assessments to its customers. But Ursa Major Solar doesn’t have a place to track and manage the results. 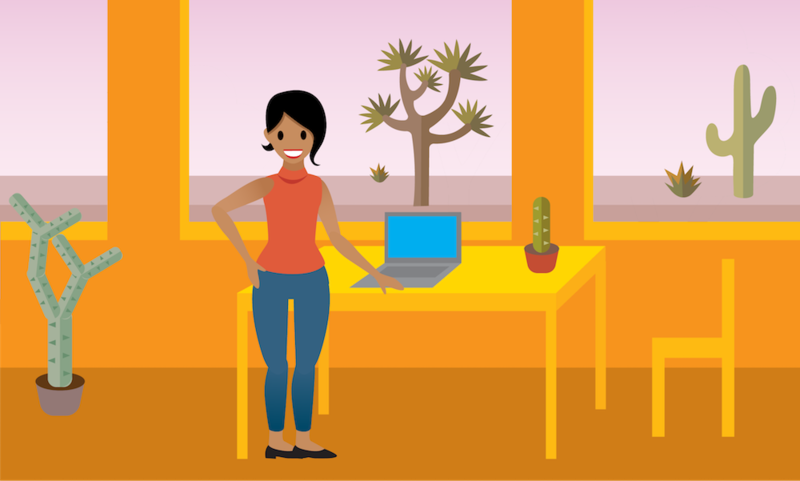 Using custom objects and fields, Maria’s going to build an energy consulting app. By creating a custom object called Energy Audit, and creating a few custom fields for it, Ursa Major Solar can track information on its customers’ energy usage and recommend which type of solar panel installation is a good fit. Throughout this module, we’ll follow in Maria’s footsteps as she gets Salesforce into shape for the Ursa Major Solar team to use. Her first task is to create the Energy Audit object. We’ll use it in later units, so let’s get started! Salesforce provides standard objects and fields for common business record types, such as accounts, leads, and contacts. But every organization is unique and needs a way to tailor how data is stored. Ursa Major Solar is no different. Custom objects and fields give them a way to manage and store data to best fit their needs. All right! Let’s create the custom Energy Audit object. Enter Energy Audit as the label. Select the box to indicate that it starts with a vowel sound. In the Search Status section, select Allow Search. Select Launch New Custom Tab Wizard after saving this custom object. You’ll see why in a minute. Refresh the page. Easy peasy, right? Maria’s created the custom object, but she needs a way to make it easily accessible to her users. Creating a custom tab for a custom object is a great way to do that. This is a key step in configuring a custom object. Without a custom tab, you can’t add a custom object to an app. 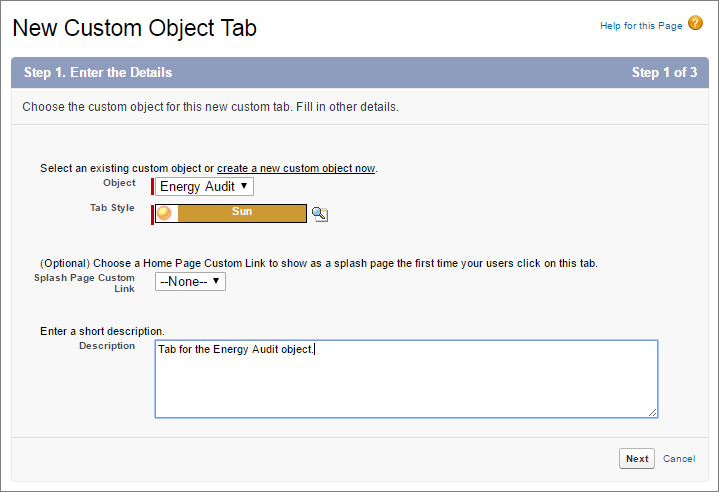 Let’s define a new tab to access the data stored in the custom Energy Audit object. This way, the Ursa Major Solar consulting team can easily find and open the object. Because you selected Launch New Custom Tab Wizard after saving this custom object, you’re right where you need to be, and the Energy Audit object is already selected. Click the Tab Style lookup icon, and select the Sun color scheme and icon for the custom tab. Choose the custom apps that you want the new custom tab to be available in. For now, let’s make the tab visible for just the Sales users. Deselect Include Tab, and select only Sales (standard__LightningSales). What’s a custom app, you say? It’s basically a set of fields, objects, permissions, and other functions assembled to support a business process. We find out more about that—and creating one—in the next unit. Now you see the details of the Energy Audit custom object. Maria’s not done yet. 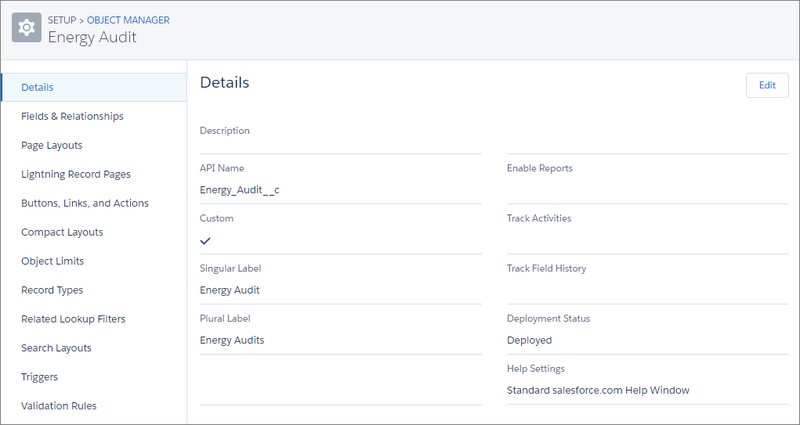 The Energy Audit object needs some custom fields so the Ursa Major energy consultants can enter information about the audit. Besides needing the Account the audit is associated with and how much energy the customer uses, the consultants also recommend where to install the solar panels. Let’s start there. 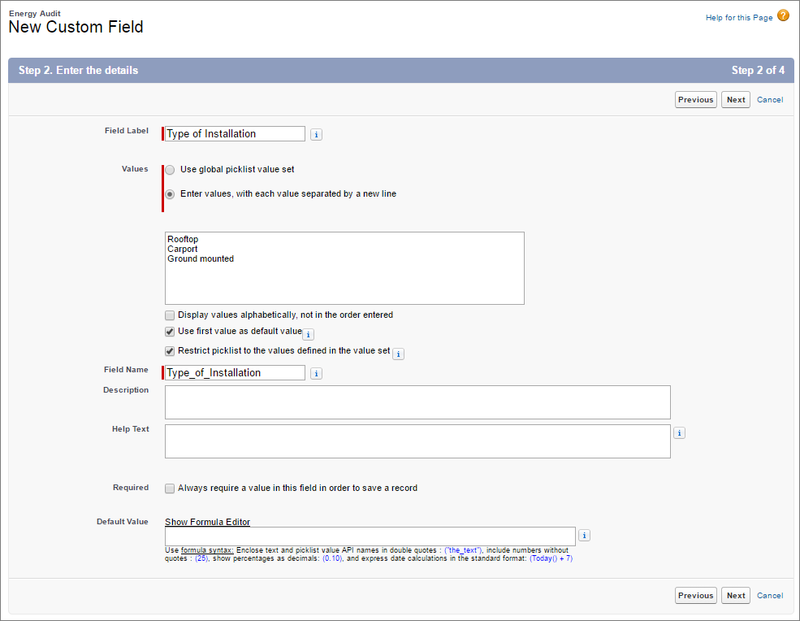 The first thing to consider when creating a custom field is figuring out what type of field you need. Let’s create a picklist field so the consultants can choose from a list of solar panel installation options. Click Fields & Relationships, then click New. Choose Picklist as the field type and click Next. Give it a label: Type of Installation. Enter the picklist values, making sure to enter each one on a new line. Select Use first value as default value, and then click Next. Leave the field-level security settings as they are, and click Next. Leave Energy Audit Layout selected, and click Save. That one field isn’t quite enough, though. The energy consultants also need to capture how much the customer is paying each month and what their monthly energy usage is. They also need a place to write up their audit evaluation. Let’s create a few more custom fields to let them do that. Unless indicated otherwise in the Parameters column, leave each field setting as-is. Always require a value in this field. Help Text: Annual cost per square foot. Number Annual Energy Usage (kWh) Help Text: Usage per square foot. Now the custom object is really taking shape. Nice work! And don’t forget that it’s easy to modify an existing custom field to fit your needs at any time. Let’s say you want to sort your data even more granularly. Or you want to change a text-entry field to a picklist to clean up data for reports. You can always come back and get things just right for your business needs. An object is nothing without records to fill it out. Prior to implementing Salesforce, Ursa Major Solar was tracking audits in a spreadsheet. Oh, the horror! Part of Maria’s job as the admin is to enter those audit records into Salesforce. And, we use them later in the module. Let’s get to it. 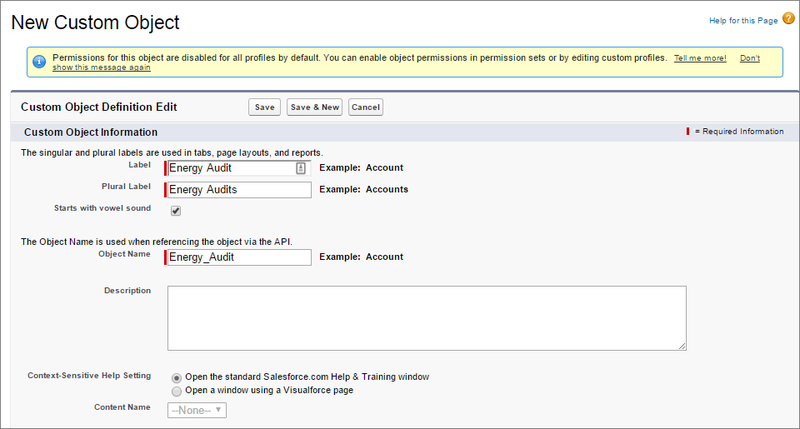 From Setup, click , and under All Items, click Energy Audits. Add a record with these parameters. These numbers seem small, but they’re cost and usage per square foot. For buildings with many thousands of square feet, that adds up to a lot of energy use and a big bill! Hint: Type “Burlington” into the Account field to see all accounts that match what you entered. Let’s add a few more records to flesh things out. Nice job! We’ll put those into use shortly.